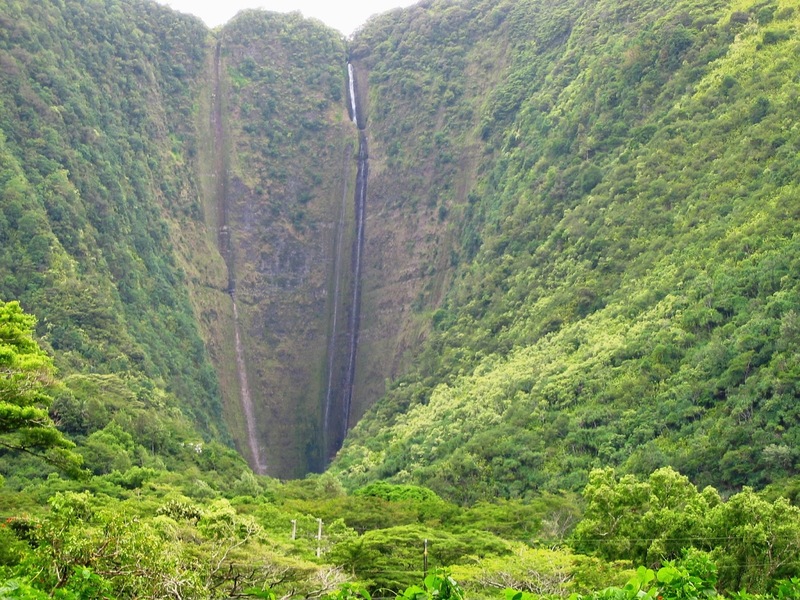 This fall is 1600ft high with 1000ft free fall, highest water fall in Hawaii. 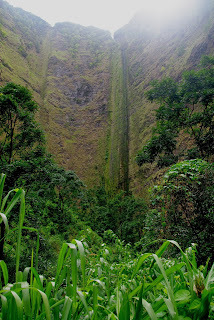 There is a dam for agriculture purpose on the cliff so volume of water is not so much but dam is not necessary now and it might be taken away. 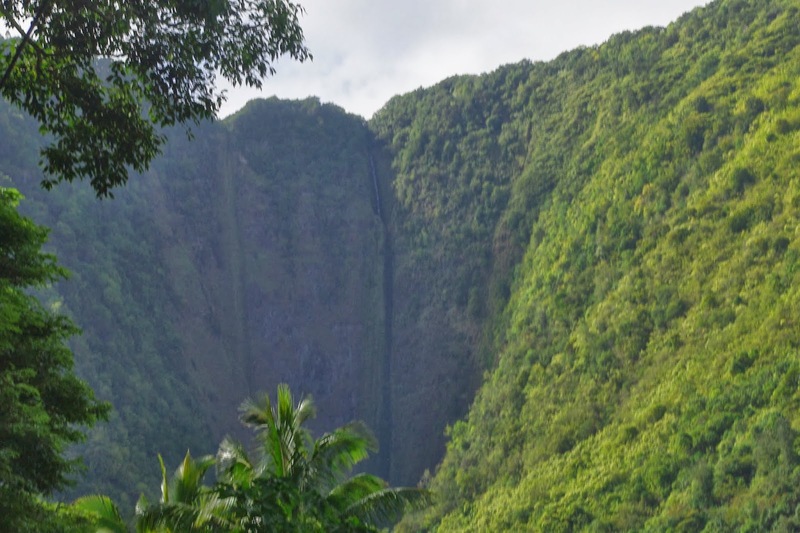 If so we will be able to see a very dynamic high water falls in the future. I challenged the hike to the basin of waterfalls with my friend and his son,second grade of junior high school. Many guide books said it is not recommended because around there are private property so may get claiming from residents. And there was no trekking rout marks. There is a post "Kapu", means No trespassing, at Taro Field but it is no problem I came here with the one of the property owner. Big problem is rout searching. We had to go up this stream, inner part of this pond was dead silence as if some monster was living there. The teacher of these students said it is necessary 45minutes for one way. Any way we had to go into water and to go that big rock at the front. At the start our clothes were dripping wet to the breast and after that we went up such rout only guided by this stream. Cold water and slippy rock, why I had to get such agony? Soon I deeply reflected to come here. On the way I always was thinking "if I slip and break bone I have to spend all night alone because he and his son go back and call rescue and if the other do I go back alone." The charming ladies with bikini passed us by. Incredible! Of course there are many ladies of mountain climbing fan in Japan. But do they come such place with bikini? We went out the woods and were able to see the falls. But difficulty was not yet finished. On the way we crossed the stream four times and walked in the streams six times. Every time water came into my Tabi (it was called Tabi in Hawaii) and became very heavy to walk. It is water proof so it does not drain if I walk in deep water. I put waterproof container in my back pack to keep my camera so it was very large for one day hike. At last we arrived at the basin of the falls. There was no falling water but it was full of beautiful water. We took 1hour 50minutes from the start. Japaneses usual says we need double the rustic people says the distance but we needed 2.5times hours the teacher said the time required. We had to go back and forth when met obstacles, big rock, etc. I said I was unhappy because of small amount of water but it was very happy to come here through the stream. Japanese also says "itchy and ouch", means one is happy and the other not. It was difficult to express it in English to them, Japanese American. This child was born almost same time of my grand daughter, they were on next bed at the hospital, so we became friend. I thought he was only a child, but now I think he is a man rather than a boy. On the way of this hike he searched the way it went through or not and held out his hand to assist me. We joined the students and on the way home. They offered prayer to god for gratitude and good luck. They did hard work so they had to change their clothes. Steep slope to go back.